January 19, 2011, "China Odyssey". December 15, 2010 Potpourri: "Alaskan River Adventure". 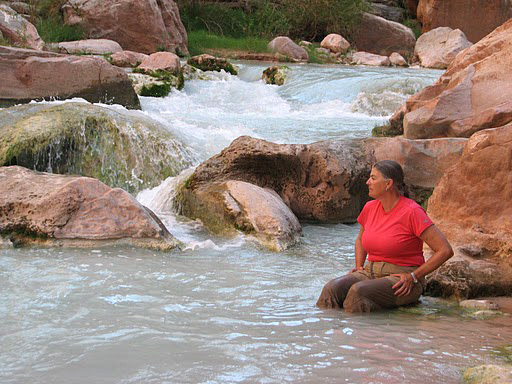 From her first wilderness expedition in Dark Canyon in 1970 to rowing an 18’ foot raft through the Grand Canyon in 2010, Lorrie Bonds-Lopez has been a wilderness addict. In the 70’s and 80’s she worked as a professional for Outward Bound and in scores of other outdoor education programs delivering 1 to 28 day wilderness experiences involving canyoneering, mountaineering, rafting and kayaking. 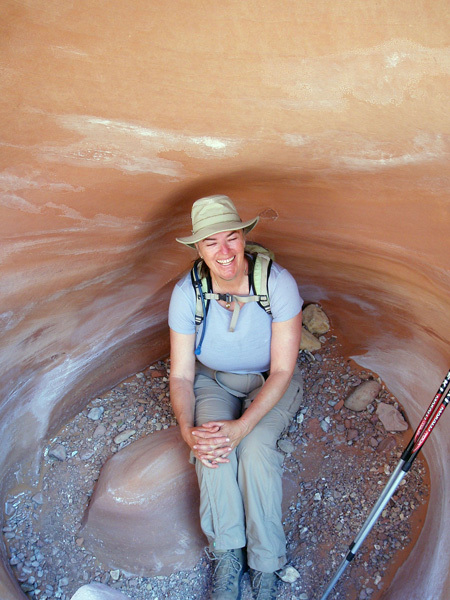 Lorrie enjoying a hiking break in a Canyonlands erosion pocket. Her travels include the rivers of Alaska, Canada, and the American West, mountain ranges from Mexico to Canada and the canyons in between. Until her first child was born, most years were spent living out of a backpack and kayak. She went on to raise her children on a diet of rivers and wilderness and now continues pursuits with far-flung trips in Asia and is constantly expanding the checklist of domestic wilderness destinations.